The Changsha Evening Newspaper recently devoted a full-page article to one Tan Shusheng (谭暑生), a scientist at the National University of Defense Technology who is challenging special relativity with his own theory of space-time. 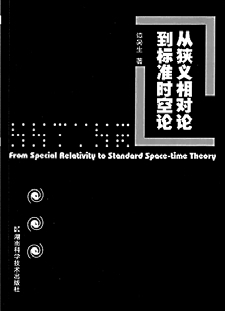 Tan’s monograph, From Special Relativity to Standard Space-Time Theory (从狭义相对论到标准时空论), was supposed to have been published several years ago, lists its publication date as July 2008, but seems to have been delayed until just this January. In a more enlightening interview conducted in 2007 by the Science and Technology Daily, Tan explained that his theory is an improvement on the Lorentz aether theory, which postulates an absolute frame of reference and a non-constant speed of light. Tan says that his contributions were to work out the spacetime coordinate transformations and formulate the whole thing into a standard spacetime theory, which includes standard spacetime electrodynamics. I can state with certainty that if the theory of standard spacetime had been published at the beginning of the Twentieth Century, humanity would have accepted it over special relativity. If you carefully read my book you will discover that this is not some wild claim but is in fact the truth. The 570,000-character work starts off with a thorough account of historical approaches to spacetime and the natural world, from ancient China’s five elements, to various understandings of aether, and finally to special relativity, before explaining his superior theoretical framework. CNBeta’s daily summary snidely remarked that Tan’s theories would be “proprietary intellectual property rights.” Chinese particle physics will at last be free of the tyranny of foreign licensing fees.